BUG FIX 17/08/2018: Now gravestones/urnstones won't give you errors. Regarding the zombie bites, sometimes they won't turn people (The probability of this happening is low) , but fear not because I'm preparing a whole new infection system for the zombie virus. 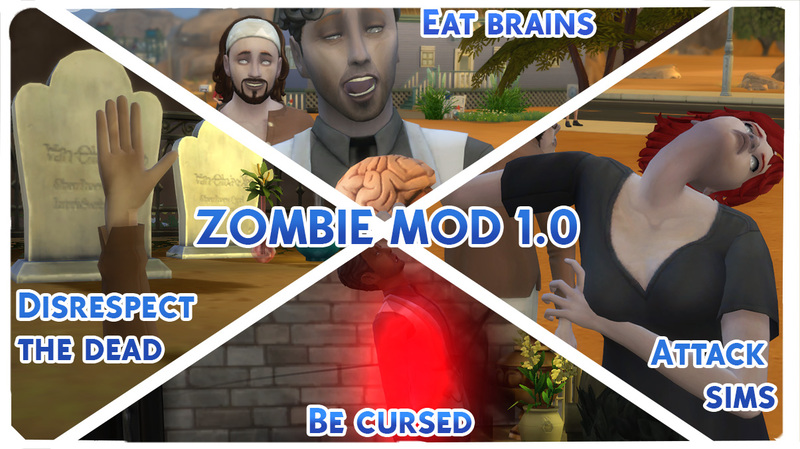 I'm glad to present to you the Zombie mod! Ready to create an apocalypse? This time, the method doesn't involve any new object. 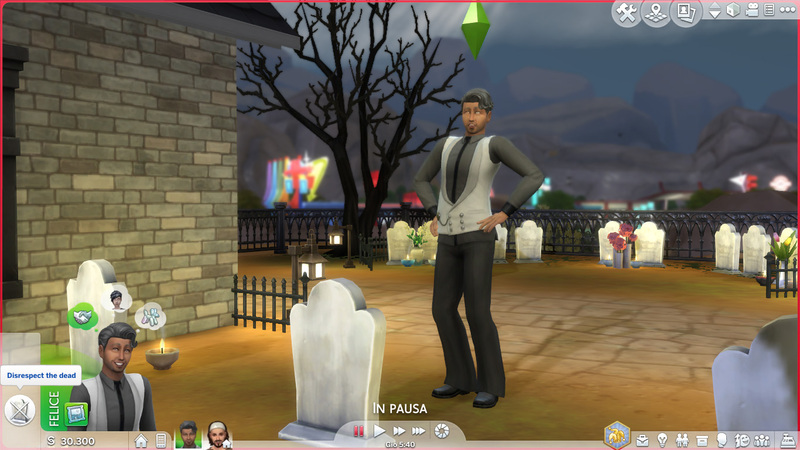 To receive the zombie curse you'll have to interact with any sim's grave, which will have a new interaction that is "Disrespect the dead" (For ghosts is "Mock the reaper"). 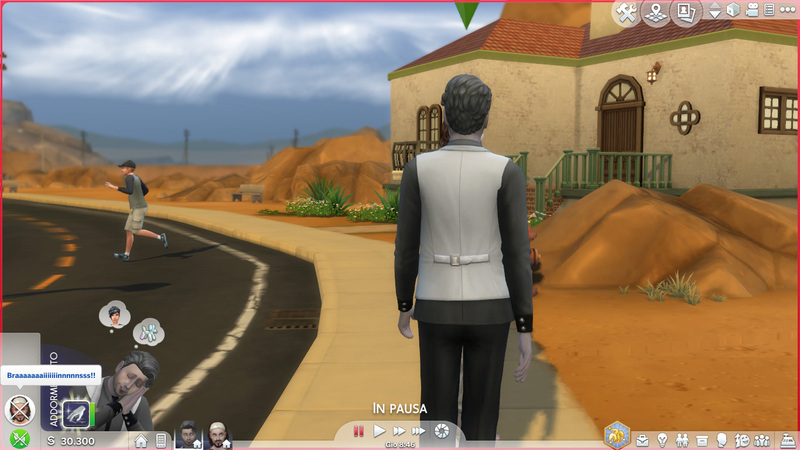 Once you click on that, your sim will begin to mock the reaper's job in front of the grave, if the reaper is on the current lot, they'll be upset about it and will have the +5 angry "Someone mocked me!" buff which will last 5/6 hours. After they're done, they'll receive a +4 tense buff called "Disrespected the dead" ("Mocked the reaper" for ghosts) which will last 1 and half day. At this point, your fate is inevitable UNLESS you beg the reaper: To beg him, you have to interact with the grave again and select the "Beg the reaper" interaction. The outcome is dual, you'll have a 50/50 chance to be saved, however even if he spares you from the curse, if you'll receive it again you won't be spared another time. 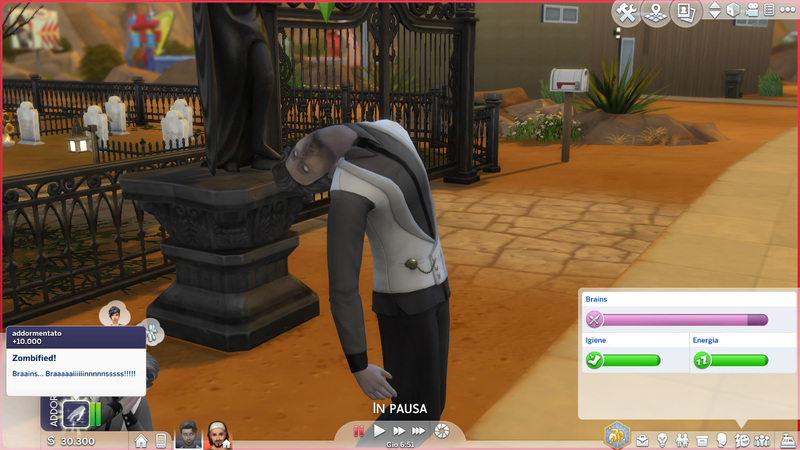 After the buff reaches it's ending, your sim will become a stinky brain-eating zombie. - Vampires, The grim reaper and ghosts will not have any visible reaction on the zombies, but they can't be attacked, so this doesn't advantage the player. - The "Braaaaaaaiiiiiiinnnnnsss!!" attack interaction could be done distantly. I HIGHLY suggest you to let your prey finish their freak out reaction. 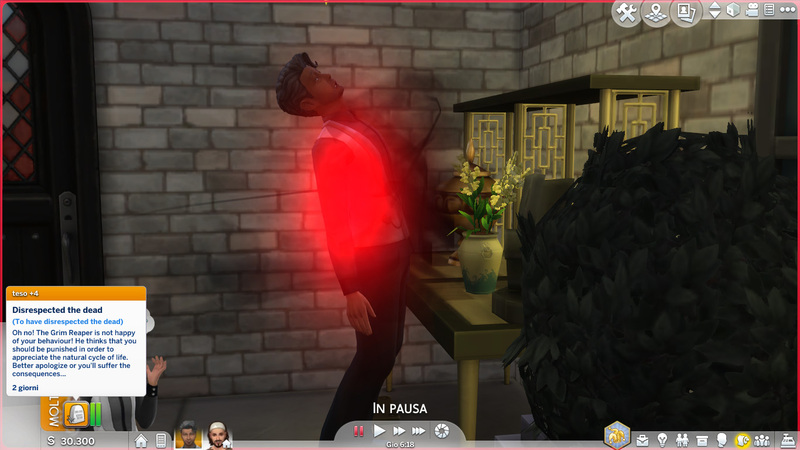 - Sims may get near instead of running away. - Zombies may spawn as townies. - The possibility to kill zombies. - Decomposition system for zombies. So any mod that has anything to do with these two objects may conflict, but I don't know about that since I haven't tested that. - Icemunmun for the edible brain. Without her I wouldn't have released this mod! - PYXIS for her zombie skin and eyes! NOTE: I added a transparency effect to the skin, so if you don't find this skin between her uploads here's the reason why! 297 people have said thanks to Nyx for this download. luvbunnyxx2 This looks exciting, I can't wait to try it! Thank you for sharing. Last edited by luvbunnyxx2 : 8th Apr 2018 at 7:20 PM. Omg this is amazing!! I canâ€™t wait to try it! Fantastic! Completely new way to play! cdshrout1171 Oh My Good Ness! Woohoo! Fb This Right Now! RoryCrafting finalmenteeee. giuro che quando qualche giorno fa ho trovato il cervello mangiabile ho pensato "spero si possa includere nella mod che Nyx sta progettando". let's try it! Chaostheory Omg. This is too cool. 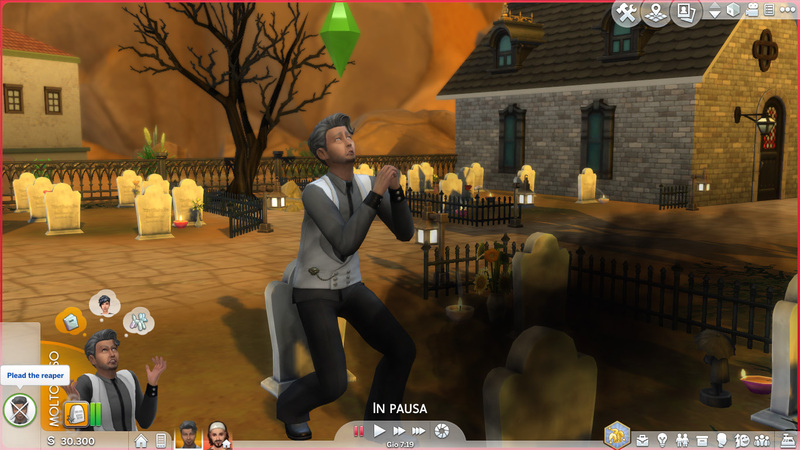 Maybe do one where your sim lady can become a banshee if she dies sad? just what I wanted in a sim game. from the sims 2 and the sims 3. Last edited by stargirlvampire : 8th Apr 2018 at 10:46 PM. Please , can you add non-autonomous interaction to eat (kill) babies and toddlers. I do think they should be able to turn children into zombies, because it makes sense. Last edited by SneakyWingPhoenix : 10th Apr 2018 at 2:51 PM. 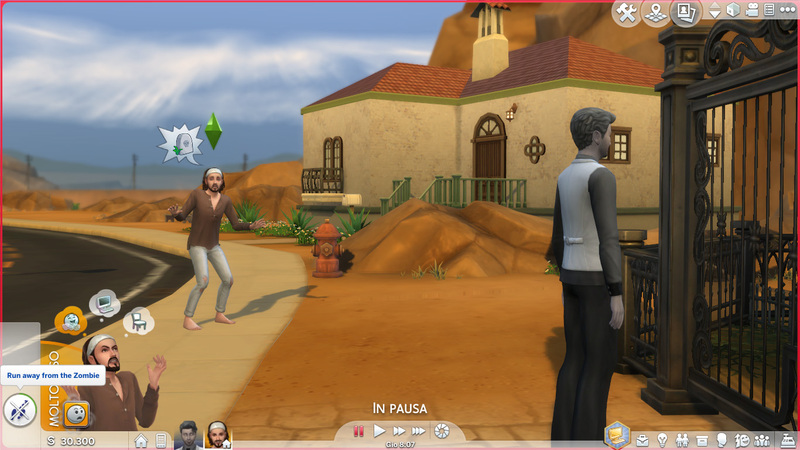 Can a zombie be able to attack alien sims? Thought I ask because I didn't see in the list of occult/sims they couldn't attack. DreadfulButterfly you're AMAZING! pls make Werewolf mod! Paola3 Her neck on that preview omg lmao I laughed so hard!! Chaostheory You know what would make this mod even more awesome? Zombie children and for zombies who've mated with other zombies, zombie babies and toddlers. RGD7 OOOOOOOOOOOOOOOOMG thanks I everytime wanted a zombie mod! thank you!!!!!!!!!! 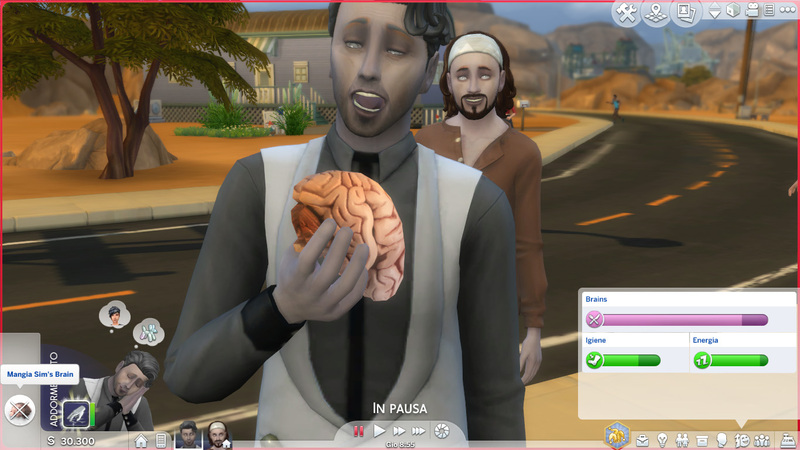 I love this mod so far but I also had an idea ( I don't know if it's possible) but how about those zombies learn skills from eating brains ( let's say the zombies eats an brain of an sim with 7 in logic) so after eating that brain the zombie would have an logic skill of 7. Jessiebecca What a lovely mod, does the zombies attack by them self to? AlexRegele11 awesome! will you make a superheroes and supervillains mod?